Up early, with only 140 miles to go to Island BMW, over on Vancouver Island. We had booked a ferry across from Horseshoe Bay to Nanaimo, which meant missing out on the busyness of Vancouver. Unfortunately, by the time we left it was spitting with rain, and as we worked our way further down the hill into Whistler it began to pour. We had a quick scoot around the Olympic Village, but didn’t get any photographs because of the dismal weather. From what I could see, the surrounds of this Millionaire’s Playground would be stunning either in full sunlight, or covered in dazzling white snow during Winter, for the ski season. The glacial waters in the lakes, and rivers were still glowing a stunning turquoise even in the gloom. Horseshoe Bay appeared quickly, and we were at the sea! Oh, that smell! the salty breeze drifting under our noses is like coming home. No matter where I go, I am always thrilled to see or smell the sea. It turned out that we need not have booked the ferry, (we had booked a car space, just in case), because as a motorcycle, we are automatically allowed on, regardless of how busy the crossing is, so we were sent down to queue for the 45 minutes before loading. Paul immediately got chatting to Luke who was taking his Harley over to Vancouver Island for the winter. Luke lives and works further up North in Canada, where there is a lot of snow during Winter, but as the Island avoids snow and has fairly temperate he can take the short crossing, and continue to ride there during winter. I got chatting to Renee, who had been with her husband and son on their three bikes over to Manitoba, a 3,600 mile round trip, to have a ‘cup of tea’ with a friend. On the ferry we shared lunch with Luke, and were very interested to hear all about his life, he used to work within the Lumber industry, (as have many people we have met), but the work came to an end and he retrained and works for Shell, in an outpost, 7 days on, 7 days off. His department cleans sand, which is sold to the U.S.A. Luke also used to be a politician, so it was a very interesting one-and-a-half-hour journey. Leaving the ferry port at Nanaimo we suddenly found ourselves in amongst some very busy small island traffic, just like at home. Most of the residences on Vancouver Island are down the East Coast, so the roads are packed. We crossed everything that our extremely worn out chain would remain in place for the last 65 miles, but I think we probably tested it right to the limit, with all the stops at traffic lights, and slowing down for traffic. With relief, we finally breezed into Island BMW at about 4.30 pm, and were extremely happy to see Bernie, when he came out to greet us straight away. 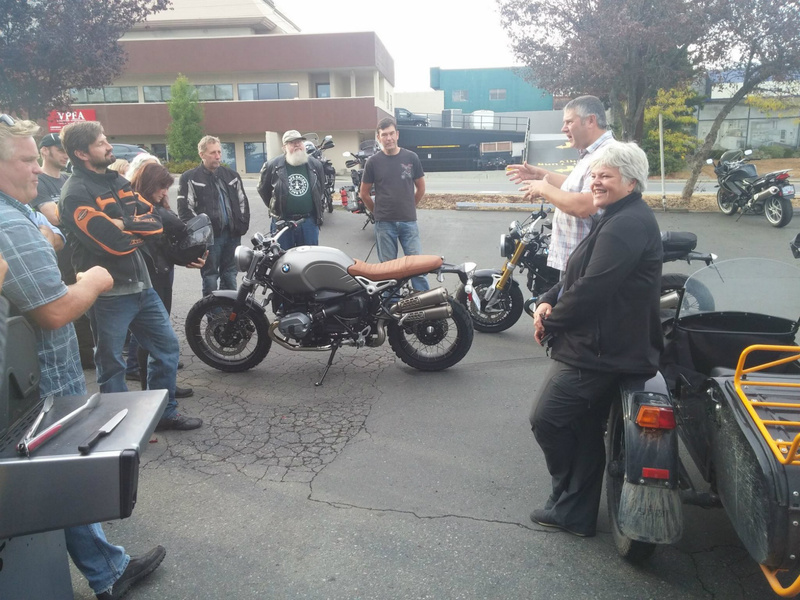 We stayed around for ‘Bike Night’ where Paul got to tell a bit of our story to some of our fellow BMW riders, and we were provided with free hot dogs! We also saw Alan, who we met at Whitehorse, a few weeks ago, and who had popped down just to say hello to us! We had a motel booked around the corner from the dealership, and Bernie dropped us off there about 7.30, where we flopped out, exhausted from all the excitement. We are staying on Vancouver Island for another 5 nights, whilst Bernie fixes our bike, so we’ve hired a car, and will use that to explore. Tonight we shall head up to the Mill Bay area, where we have rented a 5th Wheel trailer (a beautifully appointed very grand caravan). 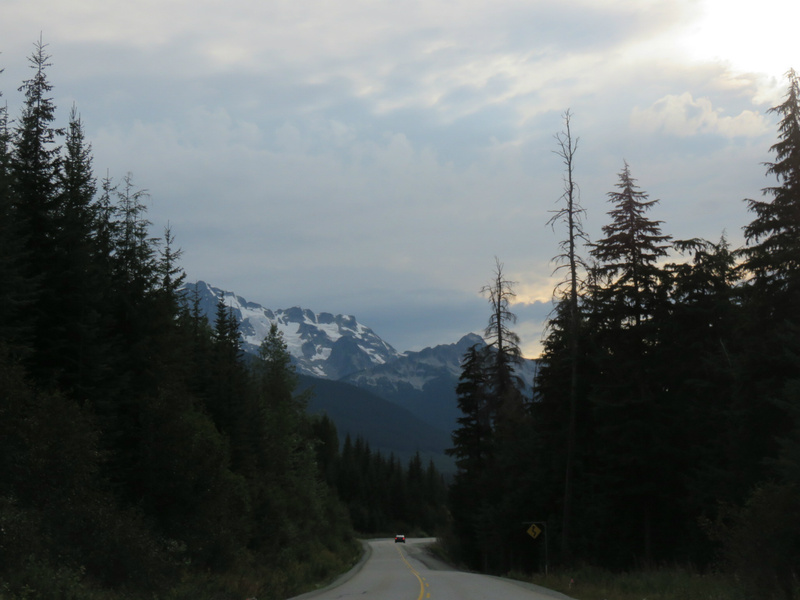 30.08.16, Mabel Lake, British Columbia to Pemberton, British Columbia. Last night was a real treat for us. Over the course of the day’s chatting it came out that we had never enjoyed a ‘Weiner Roast’ around a campfire. So, Shirley and George thought it would be a great idea to let us experience this. So the fire was set in the fire pit, and there we were toasting the Weiners (Hot Dog sausages) on forks straight into the heat. This was followed by roasting marshmallows over the fire, something else I had never done. What a wonderful evening that turned into, for me, the joy of those marshmallows melting onto your tongue, combined with the taste of smokiness was just heaven! For Paul, I think the Weiners probably topped the marshmallows, when loaded into a bun with ketchup, mustard and Sandra’s special relish. Although, the bananas cooked on the stove, with melted marshmallows and chocolate was pretty darned good too. This was followed up by stepping onto the air strip behind George and Shirley’s lot to enjoy staring up at the stars in the complete darkness of the sky, and stillness of the night. The milky way was shining bright, and the sky was sparkling. A magical evening. This morning we enjoyed a leisurely breakfast and goodbyes with our newly found friends, and we left with promises to keep in touch, and left at about 11. The first part of our journey was in reverse of the journey to Mabel Lake, so we were able to wave at the Gas Station we spent so much time at during ‘tyre-gate’ on Sunday. However, this time at Cache Creek, we took the turn for Lillooet, which turned into some really good riding. The temperature has remained higher after the last couple of days, so it was very pleasant indeed. At the fuel stop at Lillooet, we met Richard Duvall, a guy riding from his hometown of Prince George to Vancouver Island to visit a friend. It turned out that Richard was staying at the same motel as us, in Mount Currie, Pemberton, which is called The Hitching Post. We decided to ride the last part of the journey together, and Richard told us just how lovely this ride was going to be. He was certainly not wrong, it was stunning, with huge craggy rocks rising up around us, and some narrower twisty roads, which Paul had the sidecar skipping over, what a great ride! Our day has ended as well as it began with Richard being very generous and treating us to dinner in the local Thai restaurant, where we spent a lovely evening swapping stories of the road. Richard has travelled a lot in the U.S., so was able to give us some really good ideas for visiting California and Utah, in particular, and he has promised to send us other suggestions along our way. Well, the rain had stopped when we started out yesterday morning from Clinton, so that was excellent. We knew we were in for a scenic and easy ride today as we were off to meet George and Shirley, the lovely couple we met three weeks ago at Fort Nelson on the Alaska Highway, who had so kindly invited us to their lakeside cabin at Mabel Lake. We figured that this was only a 150-mile ride, so it should be easy, right? Perhaps not so easy, when an hour and a half into the journey we had just passed a Gas Station on a corner and were going uphill at 60 mph when the bike began weaving about, from where I sat it seemed quite wildly, but Paul assured me it was all under control! We had a puncture……. Luckily, it was at the beginning of a two lane stretch on our side of the road, so we leapt off and out, and could push the bike back 200 yards back to the station again, without being in too much danger from the passing cars. 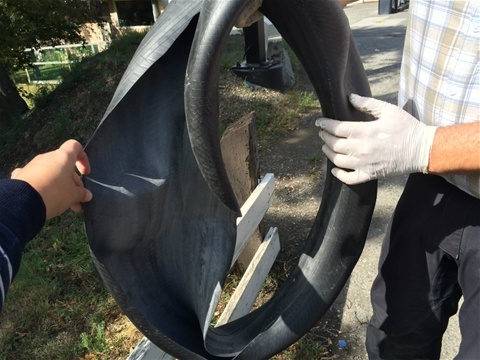 So we had a safe place to work, and Paul methodically started working through the steps to remove the wheel, take the tyre off, put the new tube in, get the tyre back on, and then put the wheel back into place. Anyone that knows Paul will know that mechanics is not his forte, but he been for some practice with Paul Wellard before we left, and it certainly paid off, because all went as smoothly as possible. We had all the tools Paul needed, with the only problem being that the mini air compressor we had required power from the battery of the bike. As we are still running on our back up car battery, we were unsure how much we should use the small compressor and the Gas Station had no air pump. So we had asked George if he had an air compressor, and he kindly told us yes, and he would ride the 2 hours over from Mabel Lake and bring it with him. George arrived and saved the day, before turning around and riding all the way back to where he started, this time with us in tow. Shirley was waiting for us, with Gin and Tonics and Beer in hand, plus a lovely dinner of chicken and rice, all cooked outside for us. We ended the evening by sitting around the fire, and swapping tales of the road. Today, we have enjoyed a much needed day off with George and Shirley, the peacefulness here and the beauty of the lake, that Paul was lucky enough to go out on in George’s boat, is a wonderful respite from the road. I am sitting here relaxing as I write, surrounded by trees, with a squirrel peeking over the log pile, looking forward to another evening of tall tales and a mesmerising fire. Thank you for your wonderful hospitality George and Shirley. 26.08.16-27.08.16, Telkwa, British Columbia, to Prince George, to Clinton, British Columbia. Canada. Yesterday, after a wonderful breakfast at the Bakery and Café that were below our lodgings we moved on again. This was after Paul rigged up the whole battery thing, and there was still some trepidation before we set off about whether the charge in the battery would get us the entire 220 miles. It did, thank goodness. We rode just over 100 miles before stopping, so that the bike didn’t have to be re-started too often and take all the charge. Then the next 110 miles before stopping for fuel and a supermarket shop. We had chosen an AirBnB property to stay in last night on the outskirts of Prince George, just so we would be out of the busy city centre. The property was about 10 miles out of the centre, absolutely ideal. We had the entire basement area to ourselves. This was the third AirBnB property used, and they’ve all been a home from home, such a good idea. 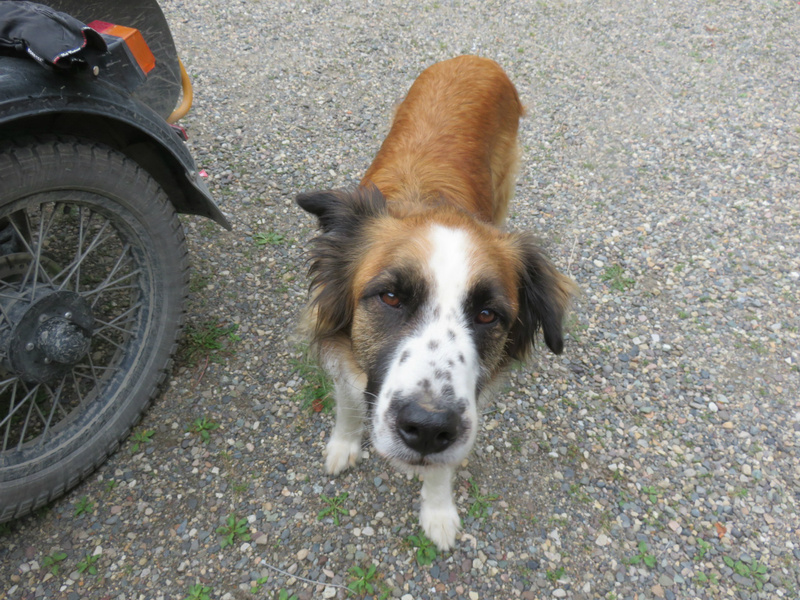 When we arrived at the property, we were greeted by the ‘guard dog’, who we had been warned about (or the fact that he was a big softie anyway! ), he was very interested in our shopping, and licking the wheels, and when Paul was removing the battery for bringing indoors, he looked round to see the dog was enjoying a nice dinner of an entire dead mouse! Mm, nice. Anyway, once indoors, and fully unloaded, we put the battery onto charge, and in less than 30 minutes the green light popped on and it was fully charged! It became obvious that we’d probably only used a tiny amount of the full battery charge. With that in mind, we were optimistic that today’s mileage would be ok at 265 miles. So when we went upstairs from the basement this morning, we were taken aback to see our ‘this’ll be a breeze’ plans scuppered by a lot of rain falling straight down from the sky. So after packing in the rain, we rode for about 4 hours in the rain, before an hours respite, then the last 30 minutes in rain, until we got off to check in at the motel in Clinton, when it decided to rain even harder! Never mind, I’m sure everything will be dry by the morning, and we just rounded off the day with a good home cooked meal at the Cordial Diner to warm us up again. After idling away our time looking for the bears yesterday, we made our way back across the huge divide of three miles between the U.S and Canada that we had travelled. Prior to that, we had tried to visit Salmon Glacier along the unmade road through Tongass National Forest, but only made it a couple of miles up the gravel before deciding to turn around. What with the rigidity of the sidecar and the shaking up of the bike, it was only making for a very unpleasant experience. Anyway, we pulled into our spot (luckily at the front of the queue) to be checked back into Canada at Canadian Customs- and as we did the bike shuddered to a stop. When we had been checked in, the officer said we could move off again, and Paul began to try and start the bike, again, and again, and again. It just did not happen, there was nothing. So, we decided to pull to the side, around the back of the customs building, in the shade, so Paul pushed the outfit there. Paul then proceeded to have a look through all obvious areas, and I suggested perhaps it was out of fuel, even though the fuel guage didn’t read empty. Paul poured some fuel in from one of our cans, and yes! The bike fired up, but oh, hang on,no! it stalled again on revving. It was at this point that Paul started to mention the Generator and Regulator Rectifier again. This was an issue our bike had previously, on two occasions, where the Generator overheats and burns out, thus not making electricity required to repower the battery as we ride along. In actual fact, Paul had a Generator re-wound before we left, and it is waiting to be sent out if required. Not much good when we actually needed it right there and then. Anyway, we also carry a fully charged jumppack, which we were able to use to jumpstart the battery, and then Paul rode those three miles back into town, in second gear keeping the revs high to try and keep going. Just as we arrive into town, who should step out into the road with his hand up but a Canadian Mounted Policeman (no, he wasn’t on a horse), who proceeded to tell Paul that he was riding at 43 kilometres per hour in a 30 kilometres per hour zone! Luckily, he was lenient and kind, and could hear we were struggling, so he sent us on our way to the local garage. By the time we reached there, most of the lights and electronics were failing. At the garage we decided we would make use of our GS-911 gadget that plugs into the bike’s ‘brain’ and can read fault codes, and print these to a laptop. I returned to the hotel for the laptop, and off we went. The readings confirmed to us that the battery wasn’t making enough power and that the fuel pump couldn’t work because of that. Paul had also bought a volt meter to measure the battery, locally, which confirmed the same thing. We jump started the bike again, before heading back to the hotel, to think. 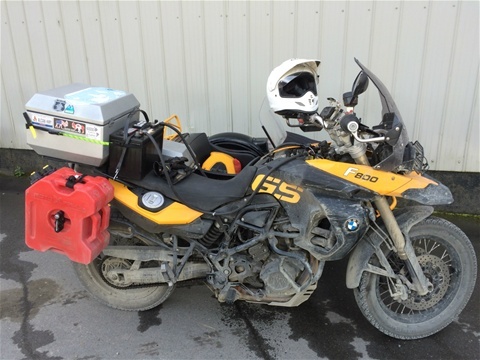 We already have the bike booked in for a service with our mate Bernie, at Island BMW on Vancouver Island, on 2nd September, just over a week (and 975 miles) away. Paul and I met Bernie last year, in Morocco, when he was a mechanic for Desert Rose, and Patsy. He’s a great guy, and super knowledgeable about anything bikes. As we are actually all on the same time zone, Paul decided to wifi call Bernie. Bernie immediately talked Paul through some checks he could carry out, and came up with the great solution of buying a battery charger along with a car battery ,with the battery to attach to the bike somehow. The idea being a car battery is larger and should therefore last longer before becoming flat. We could then use the charger to recharge the battery each evening. Paul went back to the garage this morning, and a very great guy called Darryl was able to implement all of this, and the picture attached is the result. We set off about 12pm finally, with fingers crossed, and Bear Spray in hand (in case of breakdown in the ‘bear corridor’), and the bike rode like a dream all the way. By this time Paul had started the engine four times, and it didn’t miss a beat. Therefore in our motel tonight, we have the battery charger and battery in situ with us.